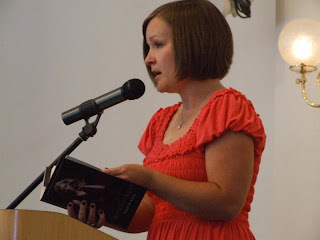 Provo City Library hosted another great author on August 2nd; LDS, YA, New York Times bestselling author Kiersten White. Kiersten is from Utah and graduated from BYU with a degree in English. She now lives in San Diego, CA with her husband (whom she affectionately refers to as "Hot Stuff" on her blog) and two young children -a boy and a girl. Kiersten's debut novel in 2010 was Paranormalcy, a witty, modern, paranormal romance and first in a trilogy. The second book, Supernaturally, was released this July (hence the tour visit! Yay!). And guess what? (why is there a question mark there?) -There's going to be a Paranormalcy movie (check out Kiersten's blog post and corresponding links for info). Kiersten's other writing includes a short story in the steam punk anthology Corsets and Clockwork called, Tick-Tick-Boom and an essay in a book about the Vampire Diaries TV show, Visitor's Guide to Mystic Falls. Her first published short story ever though was Tangled in BYU's Leading Edge student journal. Near the beginning of this year, I happened upon Paranormalcy via the kindle app on my iPad. I read a sample and instantly loved it. I decided that instead of buying the e-version I needed to own a nice hardcover copy and read it the old fashioned way (I like the convenience of e-reading, but there's just something special about a physical book, the weight and smell and turning of pages, in your hands. And probably a little bit of a possessive, hoarding tendency). I also looked up the author and lo and behold, she is LDS. I just think it's so cool when an LDS author is nationally published. It makes me all happy inside (why is this? I think it's because I'm LDS too and I feel connected to them in a sliver of a way. "These is my people!" a tiny voice flips and shouts in my heart. And maybe someday I will be added to their ranks. *dream, dream*). After reading Paranormalcy, I pre-ordered Supernaturally when the pre-ordering became available. In the mean-time, Kiersten came to the BYU hosted Utah Festival of Books on June 4th. She spoke individually (but I was stuck in line for James Dashner's autograph! See Dashner post here) but also participated on a panel of female authors (notes taken, but yet to be typed into a post! Sorry!). I brought along my copy of Paranormalcy and was able to meet Kiersten and get her autograph as well as a photo (below)! EDIT: Click here for my notes from the lady, YA author panel. I finally received Supernaturally in July and gobbled it up. Kiersten's style of writing is refreshing and fun. She focuses on humor and character interactions, but that's not to say there isn't anything serious in her books. There totally is -like dealing with feelings of intense loneliness, acutely desiring acceptance, shouldering the weight of crucial decisions, and deciding which shade of pink to wear with which cute boots. To get a feel for Kiersten's writing you should totally check out her blog. It's awesome. So without further ado (because too much ado can really put a damper on things) here is the video of the Provo City Library Kiersten White Lecture! Just FYI because I thought it was pretty cool, Courtney Lowe, the PCL PR woman extraordinaire, dressed up as Evie (Paranormalcy, Supernaturally main character) complete with blonde wig, bejeweled jeans, IPCA t-shirt (read the books to know what that is), and pink ta-ta shoes! There was also a group of attendees who had on pink (because it's Evie's favorite color) t-shirts with IPCA and other book related words on them. Hooray for book fans! We went to the lecture for book club!